Database Systems Corp. (DSC) is a leading provider of call center phone systems and call center outsourcing including voice broadcasting service. Our voice broadcast service can send phone messages and announcements to your clients and community. Phone messages can be computer generated from your systems or websites and delivered to your clients using our Voice XML Push technology. Our voice broadcast system can send calls to one individual or to millions. A Pre-recorded message can be played to either an individual answering the phone or to an answering machine. Messages can be simply a warning to individuals informing them of emergency alerts, community events, upcoming appointments, or simply sales promotions. A different message can be designated for an answering machine versus an individual. Simple to complex scripts can be developed for touchphone response. 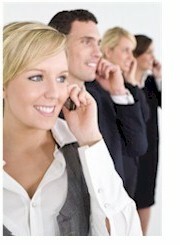 Calls can be directed to operators that are standing by or can be transferred to outside third parties. Contact DSC to learn more about our voice broadcasting service and voice broadcast systems. To learn how to use our voice broadcasting services, click on the Voice Broadcast Quick Tour. (Popups must be enabled on your browser). The U.S. Post Offices in Columbus Ohio utilizes our voice broadcasting services to contact postal employees in the event of an emergency. Emergency phone messages are sent to employees notifying them of a facility shutdown or other emergency situation. Messages also are sent informing employees to contact their emergency center 800 number for specific information and instructions. Database Systems Corp. can provide your organization with a complete, turnkey voice broadcast system. If you need to get a project or campaign started immediately, we can provide your organization voice broadcast outsourcing at our multiple call center locations. These services are ideal for political calls and community or customer notifications. For an online tour of voice broadcasting service, visit our voice broadcasting demonstration page.